Do Not Disturb is a feature that has iPhone silence incoming calls when iPhone is locked, displaying only a moon-shaped icon to let you know that a call is coming in. To turn the feature on, tap Settings. Tap Do Not Disturb and then tap the On/Off switch labeled Manual to turn the feature on. 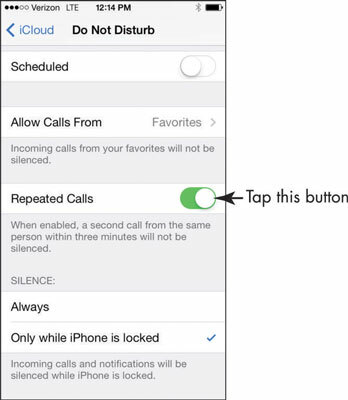 When you turn on the Do Not Disturb feature, be aware that calls from Favorites are automatically allowed through by default, though you can change that setting by tapping the Allow Calls From option in Settings. If there are people whose calls you want to receive even when the Do Not Disturb feature is turned on, you can set up that capability. You can also set up a feature that allows a second call from the same number made within three minutes of the first to ring through. The theory with this feature is that two calls within a few minutes of each other might suggest an emergency situation that you’ll want to respond to. With the Do Not Disturb feature turned on, tap Settings. Tap Do Not Disturb, and on the Do Not Disturb screen, tap the Repeated Calls On/Off switch. If you want to schedule Do Not Disturb to be active only during a certain time period, such as your lunch hour, tap the Scheduled feature and then set a time range.